Justinian (482-565 A.D.), who ruled the Roman Empire from his capital in Constantinople, was, along with his wife Empress Theodora, one of the most scandalous monarchs in history. During his reign, Justinian oversaw the construction of the Hagia Sophia, one of the wonders of the ancient world, and he strove to maintain Rome’s territories. Yet despite the heights reached under his rule, the time was one of revolts, intrigues, and brutality to his subjects. 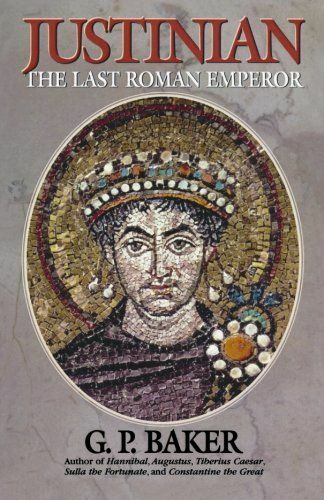 Baker’s biography takes a redemptive view of Justinian and his wife, both of whom were vilified by the chronicler Procopius, he for his despotism and she for her endless sexual escapades. Baker points out that Justinian also codified Roman law and brought other modern solutions to the problems that had plagued his empire for years. Baker also describes the battles of Justinian’s famous general Belisarius, who waged successful wars against the Vandals, Goths, and Persians on behalf of his emperor.